That is the date the Pittsburgh Steelers kick off their 2018 regular season against the Cleveland Browns. It appears that is also likely the date that Le’Veon Bell will suit up in a Steelers uniform for the first time this season. Bell did not report to training camp after failing to get a long-term contract worked out in place of the franchise tag that the Steelers placed on him this offseason. There doesn’t look to be any intention of the top RB in the NFL returning to the team before the preseason is over either. What’s interesting about this year’s holdout for Bell is that this situation has happened before, just last year. In 2017, Bell did not report to the team until the preseason had concluded, like many expect him to do again this season. This means that we have an almost exact sample to look back on to see what potential effect Bell’s holdout will have on his performance heading into the regular season this year. The numbers indicate that the holdout did have an effect on him on a season ago. Looking at those grades, it’s easy to say that Bell had a down year and dismiss it as that. After finishing among the top six running backs in overall grade each of the three prior seasons, he finished 18th in 2017. However, looking closer at his grades, the first three games put a dent in his overall grade for the season. 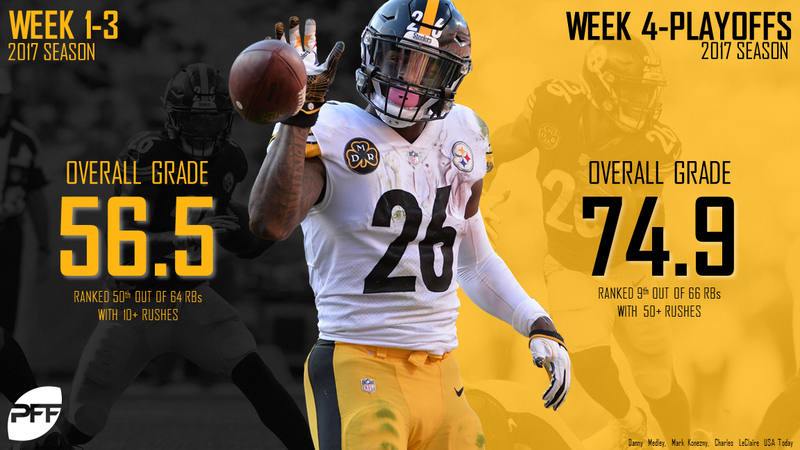 Over the first three games against the Browns, Minnesota Vikings and Chicago Bears, Bell received an overall grade of 56.5 which ranked 50th out of 64 running backs with at least 10 rushing attempts over that span. That certainly wasn’t characteristic of the running back who had carved out a name for himself as one of the premier dual-threat running backs in the NFL. That three-game stretch of poor performances to start the season from Bell did not necessarily come directly from him holding out through the offseason. The Browns, Vikings and Bears all had top-10 run defenses a season ago based on PFF team run-defense grade after all. However, the time that Bell missed with the team throughout training camp and the preseason does come to the front as a potential cause for his early season struggles. Week 4 of last season saw Bell begin to look like himself again. In the contest against the Baltimore Ravens, he forced seven missed tackles on the ground, his second-highest single-game total of the season, and turned four receptions into 42 receiving yards of which 46 yards were after the catch. That game kicked off the rest of the season for Bell with results that were more like what he was/we are accustomed to seeing. From Week 4 through the playoffs, he received an overall grade of 74.9 which ranked ninth out of 66 running backs with at least 50 carries. That mark is lower than the grades throughout his career, but it was still good enough for a top-10 ranking. Both main facets of Bell’s game – rushing and receiving – saw an uptick after Week 3 as part of that boost in overall performance. 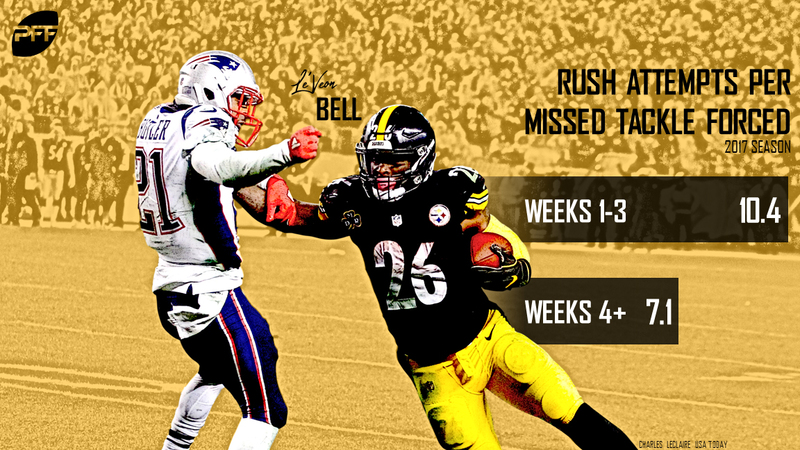 In Weeks 1-3, Bell ran the ball 10.4 times per missed tackle he forced on the ground. From Week 4 on, that number dropped to just 7.1 rushing attempts per missed tackle forced. He also did a better job running through contact later in the season as his yards after contact per attempt of 2.1 yards in Weeks 1-3, jumped to 2.6 yards from Week 4 on. Perhaps the area where Bell saw the most improvement after Week 3 was in the receiving game. From then on, Bell saw the most targets of any running back (95), most receptions of any running back (81) and had the second-most receiving yards of any running back (687). Over that stretch, he put together a receiving grade of 80.0 which ranked 10th among 51 running backs with at least 25 targets over that span. Just looking at his numbers in the receiving game, Bell wasn’t making any big plays in the first three weeks. He averaged only 4.3 yards per reception and 0.64 yards per route run which ranked 43rd of 47 qualifying running backs. Those numbers don’t compare favorably to his 8.5 yards per reception and 1.46 yards per route run after his Week 3 contest against the Bears. 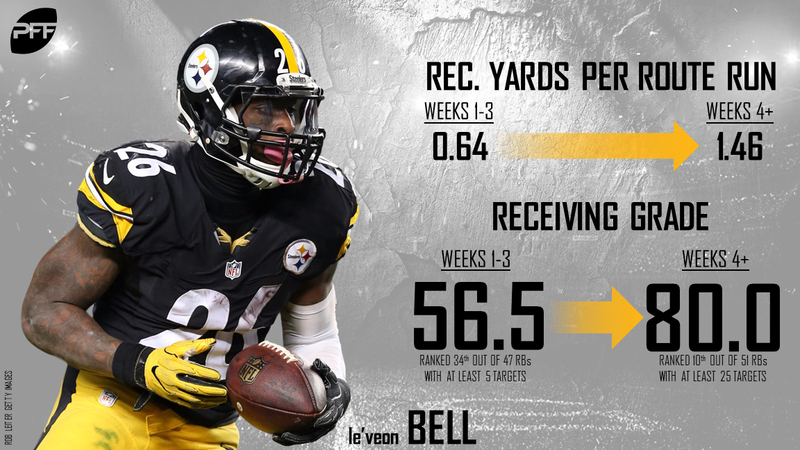 Whether it was rushing or receiving, Bell did not perform up to the level we’ve come to expect of him out of the gates last season. With his holdout this year mirroring the situation we saw a year ago, it could mean another sluggish start for Bell out of the gates in 2018. Take into consideration as well, during their first three weeks, his only reprieve may come from the Kansas City Chiefs in Week 2, who found themselves as our No. 31-ranked run-defense unit for the season. The Browns (Week 1 opponent) ranked 12th while the Tampa Bay Buccaneers (Week 3) ranked fifth. For the second straight year, it may be until a Week 4 matchup with the divisional-rival Ravens that we might see a rust-free Bell on the football field once again.